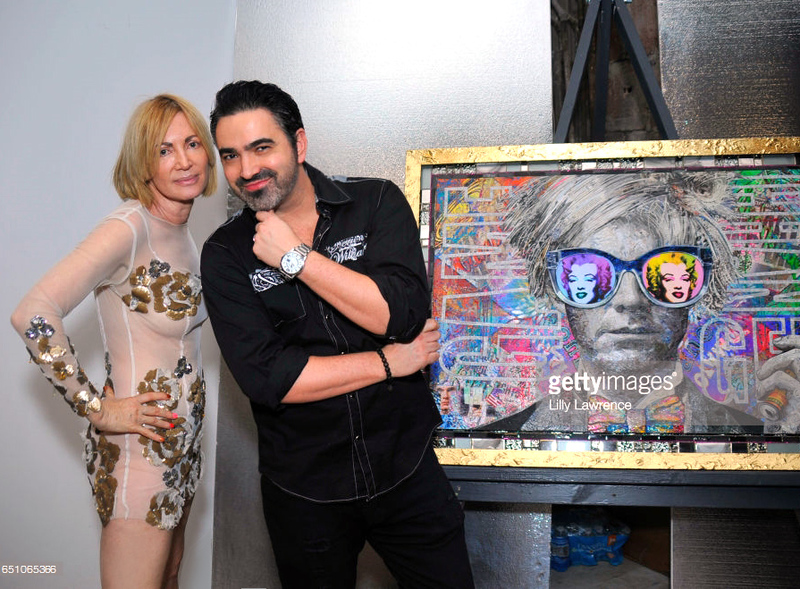 Brayden with Artist Karen Bystedt next to an artwork they collaborated on based on her photographic image of Andy Warhol. Photo credit Lilly Lawrence Getty Images. 12 plus years freelance photographer published at the highest levels possible internationally as a photographer, shooting with super models and a multitude of celebrities. The works that I create delve into the essence of a smaller story with in the larger context of a greater story line when looking at the work further back. A good example would be the story happening on a street corner in Los Angeles, then when the viewer pulls out to an aerial view they might see a bigger story going on seeing the entire city. When you look close at the thousands of images I use to create my collages you will understand. I started obsessively building my photos out of recycled magazines, and as I created more and more collages, I started to mix more and more elements into them. As a photographer through the years I started to build a fascination with the idea of how disposable printed media is, and also a internal feeling of sadness for how the digital revolution has cheapen the cost of photography work. With many years of working in the digital realm, I also felt this need to build with my hands, and have more of a physical connection with my work. As well I Internally I feel a satisfaction into breathing new life into these discarded magazines. While developing my craft, I started to become very proficient with the x-acto knife, that my mother an art teacher that used to carve stamps taught me how to use at an early age. I am able to create a cohesive collage when say for an example I cut all the eye lashes out, instead of painting them, because if I don’t it may detract from the quality of the collage work by cheating and using paint on the detail work. When the viewer sees my work, they are first taken in by the bright colors, and the fun story lines that I create with the greater image, but as they delve into the details of my work, they may take away a deeper message of longing, and subtle sadness masked by the beauty inherent within. In 2010 Brayden Bugazzi the alter ego of Kenneth Brayden started to revisit his passions for Art partially due to a down economy, when a wealthy owner and art collector who owned one the of the a propertie he rented out for one of his shoots that he befriended asked if he could create something artistic and that had the look of something expensive. At the time Brayden had been hit so hard during the recession, and with the hyper competitive nature of being a photographer in LA that he was forced to live in the RV he had originally bought for his photography business. He was parked a few blocks from the famous walk of stars, and felt bad at first, but surprisingly enough the guy a few spaces down from his RV was also an accomplished photographer, and had been published in magazines like Vogue to name a few. He rented a work space and started to build a super complex work of art for the wealthy patron, and he felt rejuvenated because for the first time in years since graduating art school he finally had full creative control again! At night he would be at the best parties around Hollywood, hung out with the biggest celebrities, and was living the Hollywood lifestyle, but internally he was just thinking about the fire that had been lit inside of him again. One night his world got turned upside down when he was at a club in Hollywood and a bouncer must have mistaken him for someone else because he grabbed him out of the blue and slammed his head against the wall knocking him into delirium, and not knowing who was attacking him he started to struggle with this person, leading the entire force of bouncers grabbing him by all of his limbs. They threw him outside face first into a big tree outside the door, and stomped and kicked him till he was passed out. His friend took him to the RV, as he woke up in agonizing pain in the morning he heard gun shots outside, and a mad man was running around a few blocks away killing random people. Also he was watching the news and he worried because there was an arsonist running around Hollywood setting cars, dumpsters, and different things on fire every night right around where he was parked. He was in a deep dark place feeling agonizing pain from his injuries, and was on the verge of packing it up, and moving from LA, when he ripped up a magazine that he always wanted to see his work published in. It fell to the floor of his RV and it looked like the pieces of the magazine formed a face. With the faint fire still burning, he decided to give his life in LA one more try, but he was going to work on Art, and move away from the fast Hot Shot Hollywood Photographer lifestyle. He quit drinking, and stopped going to bars, instead started doing more constructive things like red carpet events, art shows, and small events. By not being surrounded as much by distracting things all the time, he was able to finally build a solid relationship with a good girl he met in the area, and now is married to the love of his life. 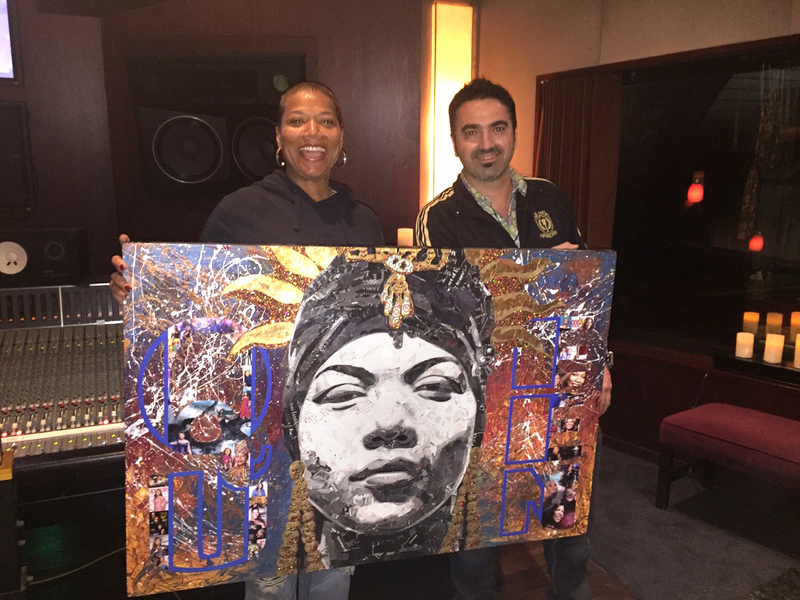 She has also motivated him even more by attending all of his events and art shows and having faith in his artwork. The wealthy patron loved the artwork he did, but pushed harder for Brayden to give the work the feel of luxury for someone with his refined taste. After he was able to find the sweep spot in the work, the patron admired what he did, and gave him a handsome payout. He took the funds from his first big commission and found a small apartment in Burbank with a garage to work in, sold his RV, and felt that fire burn brighter and brighter inside as he started to build his art business. There he took the idea with the magazine collage, and created some of his photography images as collage artworks, while utilizing the millionaires suggestions on how to make the work feel like a luxury item. He showcased some of the works he did for the Millionaire in Malibu, but the first gallery he found wanting to showcase his work in Santa Monica was interested in these new luxurious hybrid collage pieces he created. At that first show he sold the collage works, and the gallery owner had customers wanting him to create some new editions from these initial artworks he had done, thus leading to him inventing a new process of new art creation similar to the original, but new versions with new abstract paint, and collage work over a his unique custom processing. From there he has found more galleries, and he has been able to finally move the art into his main source of income, allowing him to hit his works full force, nothing holding him back. He has even done a few murals around Hollywood, taken part in top shows associated with Art Basel Miami, LA Art Show, on top of showing in big galleries from coast to coast, and selling to buyers from all around the world, on top of several A list celebrities owning and showcasing his work. He truly loves what he does, and is obsessive about his pieces, and he creates unique frames from scratch for the pieces to give a full 360 art experience. Having a first hand experience in his years working in Hollywood he knows that fame, or money are of non importance in the grand scheme of things, those two things in excess will only distract, his only one desire is to one day create a work that is so complex, so intricate in detail that it will blow the minds of all who view, in a way that doesn’t need a name next to it to validate it.